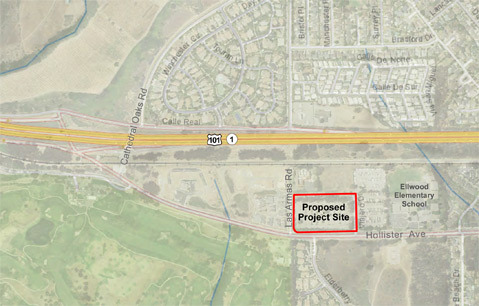 The proposed California Highway Patrol office at the western end of Hollister Avenue has its nearby neighbors at The Hideaway and around Ellwood Elementary worried about its 150-foot antenna, noise from daily testing of sirens, fumes from an on-site fuel island, increased truck traffic at an inspection station, and, of course, water use. But the ability of the current CHP location to function during an emergency concerns officials, as the building was built in 1982, prior to current earthquake standards. Since then, the population in the CHP’s service area has grown, as have the unit’s responsibilities. Requirements like access for people with disabilities could be complied with at a new facility, as well as amenities like separate locker rooms for male and female officers. If the state bought the 5.7 acres at 7780 Hollister for the CHP to use, that would effectively remove it from the City of Goleta’s permit process, City Attorney Tim Giles explained. What might prove more difficult to overcome for CHP, however, is the lack of a water meter. The property currently acts as an overflow parking lot for Bacara and doesn’t have a water entitlement that would accommodate the new CHP facility’s needs. Goleta Water District has already denied the state’s application for a water meter, but the draft EIR contains language that suggests the state’s Department of General Services could “potentially condemn a service connection from the District.” Goleta Water District’s Ryan Drake, the Water Supply and Conservation manager and also an attorney, stated the district’s lawyers didn’t agree that inverse condemnation was an applicable theory. He added that the district has suggested recycled water and drilling of a well, once the well-drilling moratorium ends, to General Services. The project is on the district’s water management agenda for November 19. A public comment meeting on the draft EIR on CHP’s proposal takes place Tuesday, December 8, 6 p.m., at the Goleta Valley Community Center Auditorium.